What happened to Matt Whitaker? 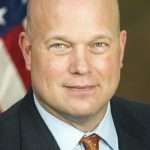 Donald Trump, rather obviously, fired Attorney General Jeff Sessions and replaced him with Acting Attorney General Matthew Whitaker in the hope that Whitaker would be able to quickly derail Special Counsel Robert Mueller’s Trump-Russia investigation. We’ve all been waiting for a sign that Whitaker either was, or wasn’t, seizing any meaningful control over the probe – and we just got a pretty strong signal on that front. We learned yesterday that Robert Mueller is negotiating a plea deal with Jerome Corsi, who would ostensibly give up Roger Stone in the process. This would represent the final nail in Stone’s indictment coffin, and would place immense pressure on Stone to flip on Donald Trump. So this Corsi move means that Mueller is basically one step from nailing Trump for colluding with Russia to alter the outcome of the election. Here’s the thing: where’s Whitaker? As far as Donald Trump is concerned, Matt Whitaker’s job is to prevent Robert Mueller from doing any more of the kind of wheeling and dealing that could result in Trump’s downfall. Yet we learned a week ago that Mueller was about to indict Corsi, and Whitaker clearly hasn’t done anything to stop that from happening, because now Corsi is in the process of caving. The big question, of course, is why. Has Robert Mueller already found a way to get Matt Whitaker to back down and stay out of the way? That wouldn’t seem to be too difficult, considering that Whitaker is under FBI criminal investigation for his scam toilet company, among other vulnerabilities. Or is Mueller simply daring Whitaker to stop him from flipping Corsi, and Whitaker doesn’t have a clue how to stop him? Stay tuned, because this is not how Trump was expecting things to go. What happened to Matt Whitaker? Is he unofficially off the chess board already?